A many to many relationship is easy to setup with code first EF. For example, an Author can write many books. And a book can have many authors. To start a library, all you need is a book set or author set (or both) in a DbContext derived class. 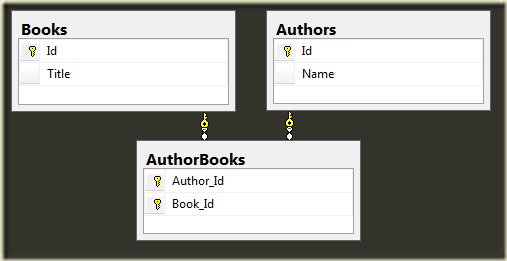 Then the framework will create a database schema with the join table you might expect. If you want to have a sequence of objects representing every book and author combination, you can use the SelectMany operator to “flatten” a sequence of book authors. Thanks for the post. I found it gets a little harrier if you need to add an additional property on the AuthorBooks like "Contribution", e.g. ("Principal", "Co-Author", etc). You have to create the AuthorBooks as an entity but it complicates the collections. I'm personally not a big fan of Code First with its dynamic queries and anonymous types which I find hard to debug or optimize in the long run.